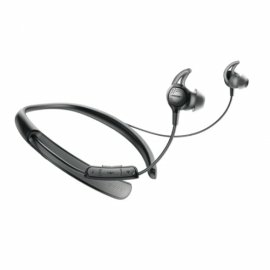 The Bose QuietControl 30 Wireless Headphones, control your environments noise which how much you can hear. With these headphones set your own level of noise cancellation and get balanced audio performance at any volume. With this lightweight design it matches the body for all day comfortability and wear ability with a Bluetooth Connection that keeps the wires out of the way. Control how much you want to let in from the outside world. Block out the distractions with the noise cancelling headphones or need to hear important information, let noise in with the Aware Mode. Throughout the day, set the options for what you want so that you have freedom to choose. With the volume optimised EQ it delivers consistent balanced sound at any volume. With the Bluetooth and NFC pairing, connect your devices wirelessly for quick and easy connections. Along with this, this device is wire free without ruining performance. This inline remote lets you take/end calls, skip and pause tracks and control the volume without reaching for your device. This allows you to focus on your music. With the Bose App it gives you easy access to your product and what it has to offer. Unlock product features, personalise your settings and spend more time enjoying your music instead of setting it up.